There are many reasons to appreciate stately, solid oaks. Raking their late-dropping leaves in December is not one of them. Persistent and tenacious, they hang on despite autumn gusts and rain storms that shake other trees bare by October’s end. And yet, as I rake pile after pile, I think: maybe we should be more like oak leaves, resolved to hang on as long as we can. Savoring each day of sun, knowing that the dark and silent winter will come all too soon. Tips & Techniques– I’m testing a new box of Schmincke watercolors, so I decided to use “negative” painting techniques with this journal page as a way to figure out the range of colors I could get with a triad of Ultramarine Blue, English Venetian Red, and Yellow Ochre. I began with a very loose wet-in-wet wash of those three colors. Once it dried, I began to pick out the shapes of the leaves with smaller, but still very wet washes. You can lay lots of layers on top of one another with this technique to build values, depth and interest. The trick is to stop before overworking it or losing the spontaneity of the original wash.
Get to know your paints! I haven’t used English Venetian Red before, and though it looks similar to Burnt Sienna, it is less transparent and mixes very differently. Look how it becomes more purple when mixed with Ultramarine Blue. 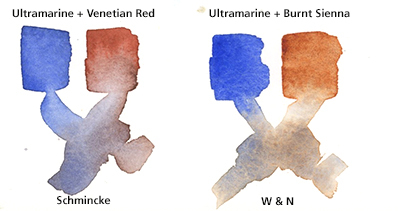 Burnt Sienna creates beautiful browns and grays with Ultramarine, a mix I use all the time. 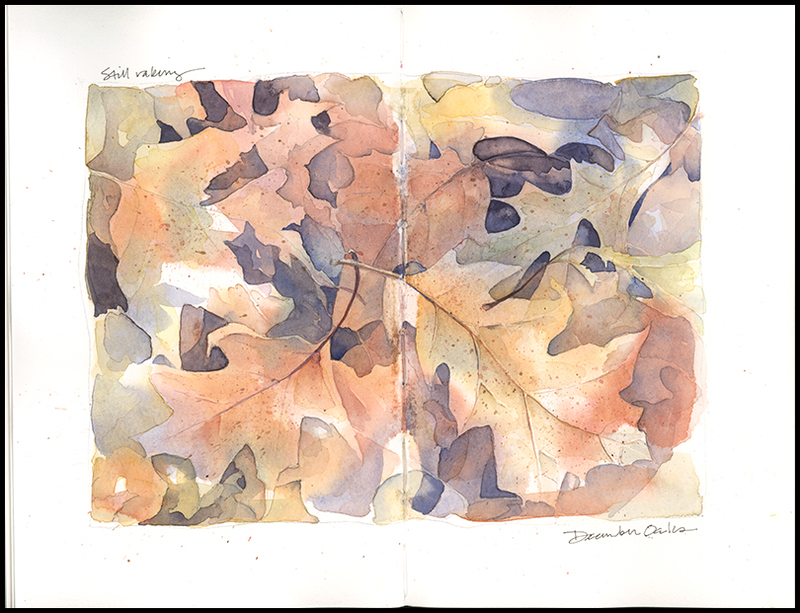 The purple toned darks worked nicely for the oak leaves, creating a lively triad with the Yellow Ochre. This entry was posted in Journal, Trees, Watercolor and tagged home, nature, negative painting, oak leaves, trees by Jean Mackay / Drawn In. Bookmark the permalink. Simply stunning, Jean. I love the overlap of the color, texture and the dimension. Thanks Sharon- it’s fun to try to bring those out in a painting like this. I love those leaves! Beautiful! And yes, knowing your tools (paints, cameras, knife, etc) you work with is essential! Glad you find the tips helpful. The tools are important, but observing and practice are essential– as you know! Of course! And there “will” come handy! Thanks Eileen– this was fun to do. I may start another one out of the journal on a regular watercolor sheet. I’d like this without the gutter. It will make you very happy to know that all bugs and butterflies prefer that you DON’T rake the leaves 🙂 Get rid of that rake! Now I’m going to go try out this wash idea, I am sorely lacking in my washing experience!! There a lots of places where we are creating naturalized areas, but we do want some lawn and oak leaves will quickly smother it! Now– about the wash- yes, this is a perfect exercise for mastering washes. Beautiful autumn leaves and lovely to see the extra images of the work in progress…. I’m glad you liked the work in progress. I think its helpful with this technique, especially because the beginning stages are so loose and nebulous. Always enjoy looking at your work and reading your thoughts and tips. Very inspiring. I’m glad to hear it! Comments like this help to keep me inspired. Beautifully and finely done, Jean! Thank you for this – very interesting to see part of the process. Beautiful results! Thanks. Glad the process was interesting and helpful. Beautiful Jean. I especially enjoy how the leaves appear and then disappear with new images underneath that I missed at first glance. Such depth. I plan to include a link to your blog on the gift of watercolours I am giving my cousin this year. Lots of great info here. Thank you, Jean. That is super kind of you. I will do that.